Hudson Baby baby boy's and baby girl's 6 piece layette set includes 2 bodysuits, 1 pair of pants, 1 bib, 1 pair of socks and 1 cotton cap. This mix and match outfit make adorable and trendy options for your little one's wardrobe. 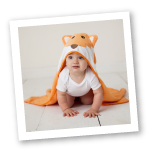 Bodysuit, pants and cap are made of 100% super soft cotton, while bib is made of cotton blend to help catch and absorb any drools or spills! Socks are also a cotton blend to stretch with baby's growing feet! Bodysuits have snap closures to make dressing time a breeze. These sets make the perfect baby shower gift!